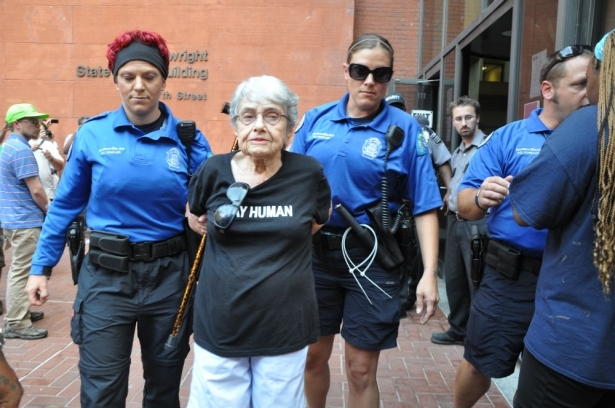 Ninety-year-old Hedy Epstein, who was one of several protestors arrested outside Missouri Governor Jay Nixon’s office, is no stranger to state-sanction discrimination and violence. Epstein fled the Holocaust as a child. A true intersectionalist, she insists on applying the lessons of the past to the present, refusing to remain idle in the face of persecution, whether she’s protesting the demolition of Palestinians’ homes or police brutality and racism in Ferguson. Epstein was born in 1924 in Freiburg, Germany, but was sent to England at 14 via the Kindertransport, which brought nearly 10,000 children from countries invaded by Nazis right before the start of World War II. Epstein’s parents died during the Holocaust in Auschwitz. Following the war, Hedy returned to Germany, where she worked on the Nuremberg medical trial, against doctors accused of performing medical experiments on concentration camp inmates. In 1948, she joined her only living relatives, an aunt and uncle, in the United States. As she explains, “The Israeli government’s actions happen far too often in the name of protecting Judaism, thereby conflating Zionism with Judaism. As Jews, we must not let the Israeli government use our heritage to excuse its morally unexcusable actions. Our Jewish values will not let us.” So, Epstein started to visit Palestine, where she’s been several times, and taken part in protest against the Occupation, the wall, and the demolition of Palestinian homes and olive orchards. Epstein published an autobiography, Remembering Is Not Enough, and speaks around the world. So, it makes sense that Epstein would join the approximately 125 people at a St Louis (where she lives) protest organized by the Organization for Black Struggle against the decision to call the National Guard into Ferguson. They marched to the Governor’s office, demanded a special prosecutor to investigate the murder of Michael Brown, a larger Department of Justice investigation and a withdrawal of the National Guard. They sang, “Ain’t gonna let nobody turn me ’round,” and chanted “Hey hey! Ho ho! National Guard has got to go!” and “Hands up! Don’t shoot!” Epstein was among nine protestors arrested for failing to disperse. They were handcuffed, taken to a police station, given a court date and then released.